Featuring ranch-raised lamb as the single protein source, Acana Grass Fed Lamb with Apple is a Biologically Appropriate food that is suitable for diet-sensitive dogs of all breeds and life stages. 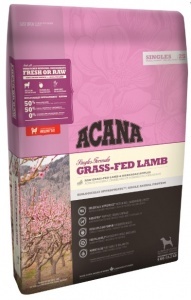 Loaded with New Zealand lamb and delivered in nourishing raw WholePrey ratios of meat, liver, tripe and cartilage, Acana Grass Fed Lamb supplies nutrients in natural form, dramatically reducing the need for synthetic ingredients. Freeze-dried lamb liver naturally enhances palatability for fussy eaters. Red Delicious apples, whole pumpkin and regional botanicals including chicory root are delivered fresh from Fraser Valley, providing a rich source of soluble fiber to support healthy digestion and firm consistent stool. Prepared with fresh and local ingredients in award-winning kitchens in Alberta Canada, ACANA Lamb and Okanagan Apple keeps your dog happy, healthy and strong.